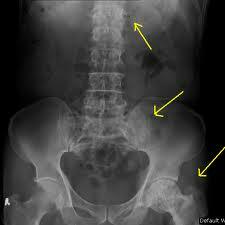 Paget’s disease of bone (PDB) affects between 1% and 2% of Caucasians over the age of 55 years. The disease is characterized by focal abnormalities of increased bone turnover affecting one or more sites throughout the skeleton. The axial skeleton is preferentially affected and the most common sites of involvement are the pelvis (70% of cases), femur (55%), lumbar spine (53%), skull (42%), and tibia (32%). The prevalence of Paget’s disease increases with age, and the disease affects about 8% of men and 5% of women by the eighth decade in the UK. The UK has the highest incidence of PDB in the world, but the disease is also common in Western and Southern Europe and in British migrants to Australia, New Zealand, and South Africa. Conversely, PDB is rare in Scandinavia, the Indian subcontinent, China, Japan, and other countries in the Far East. These ethnic differences in the incidence of PDB emphasize the importance of genetic factors in the pathogenesis of the disease, but there is evidence that environmental factors also play a role. Support for this comes from the observation that there have been reductions in the prevalence and severity of PDB in the UK, some European countries, and New Zealand over the past 25 years, and a delayed onset of the disease in children of patients with SQSTM1-mediated familial PDB. However, for reasons that are currently unclear, no major changes in severity or incidence of PDB have been observed in other countries such as Italy and some regions of the United States. It is likely that there have been changes in hitherto unidentified environmental triggers for the disease in several countries over the past 25 years. However, the reduction in disease prevalence in some countries, such as the UK, may also be due in part to changes in ethnic makeup of the population due to influx of migrants from low prevalence regions such as the Indian subcontinent and the Far East. Clinical manifestations of Paget’s disease of bone depend on the extension of the disease, the bone plasmatic levels involved and the presence of complications. Many patients are completely asymptomatic and in most cases the diagnosis is done in a casual way. Bone pain is a common complaint. Some patients notice a gradual increase and deformation of long bones or difficulties in deambulation because of the different length of inferior limbs. Sometimes there is also a growth of scull. The most common symptoms are back (usually the lumbar region) and leg pain. The pain is generally dull but sometimes can be lancinating. The cause can be the pagetic process itself or the secondary osteoarthritis. In the retina vascular streaks can be found. We can also see loss of hearing due to the implication of the ossicles of the middle ear, the involvement of the bone in cochlear region or the compression of the VIII cranial nerve. Sometimes Paget’s disease causes neurological complications due to the massive growth of bone tissue in the skull base(platybasia) or brainstem compression. The spinal cord compression, also due to pathological vertebral fractures, can lead to paraplegia. The alterations in the skull can lead to teeth loss and the compression of the optical nerve cause loss of vision. Pagetic bone has a characteristic appearance on X-rays. The bone affected appears larger and more dense than usual. In long bones an advancement line characterized by a V shape can be seen. Moreover the bone shaping follows force lines determined by muscular traction: this explains the lateral curvature of femur and the anterior curvature of shinbone, and the tendency of the bone to settle on the concave side of bones. An elevated level of alkaline phosphatase (ALP) in the blood in combination with normal calcium, phosphate and aminotransferase levels are suggestive of Paget's disease. Elevated levels of serum and urinary hydroxyproline, hydroxylisin and pyridinoline cross-link are also found. They are realised during bone reabsorpition and don’t use in new collagen synthesis. Also the measuring of C- and N- terminal collagen telopeptide can be useful. The use of CT(computerized tomography) or MR( magnetic resonance) is useful and sometimes is also used bone scintigraphy with metilbisphosphonate marked with Tc99 to see the extension of the disease. Biopsy of the bone is sometimes necessary to confirm the diagnosis. Initially, there is a marked increase in the rate of bone resorption at localized areas caused by large and numerous osteoclasts. The observation that increased concentrations of interleukin-6 are present in pagetic marrow plasma has suggested that cytokines in the marrow microenvironment may influence the differentiation of osteoclast precursors, limiting the extent of pagetic involvement to local sites once the initial lesion occurs. In addition to the morphologic abnormalities in pagetic osteoclasts, osteoclast precursors are physiologically abnormal. 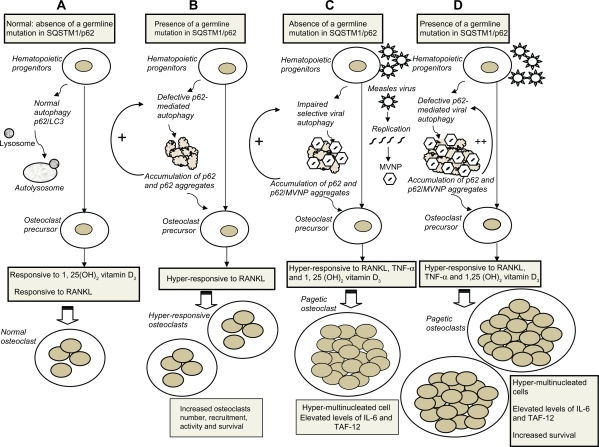 In vitro studies of bone marrow samples obtained from affected bones of Paget patients have identified several unique differences between pagetic and normal osteoclast precursors. This “pagetic phenotype” is characterized by hypersensitivity of osteoclast precursors to several osteoclastogenic factors, including 1,25-(OH)2D3 and RANKL. In addition, the level of TAFII-17, a component of the TAFIID transcription factor complex that binds the vitamin D receptor, is increased in osteoclast precursors from affected bones of Paget patients as compared with normal osteoclast precursors . The increased level of TAFII-17 appears to be responsible, in part, for the hypersensitivity of pagetic osteoclast precursors to 1,25-(OH)2D3 because it enhances the sensitivity of VDR to low concentration of 1,25-(OH)2D3 . The osteolysis is followed by a compensatory increase in bone formation induced by osteoblasts recruited to the area. This is associated with accelerated deposition of lamellar bone in a disorganized fashion. This intense cellular activity produces a chaotic picture of trabecular bone ("mosaic" pattern), rather than the normal linear lamellar pattern. The resorbed bone is replaced and the marrow spaces are filled by an excess of fibrous connective tissue with a marked increase in blood vessels, causing the bone to become hypervascular. The bone hypercellularity may then diminish, leaving a dense "pagetic bone," also known as burned-out. Mutations affecting the SQSTM1 gene cause a high penetrance form of PDB, which is inherited in an autosomal dominant manner. Mutation screening of genes within the region identified a proline to leucine mutation at codon 392 of the SQSTM1 gene in the chromosome 5q35 linked to PDB. A large number of SQSTM1 mutations have now been identified in PDB and most of these affect the UBA domain. The SQSTM1 gene encodes p62, which is an adaptor protein in the NF-kB signaling pathway. In addition to its role in regulating signaling downstream of the RANK, TNF, and NGF receptors, p62 appears to play a key role in regulating other cellular processes through its involvement in autophagy. Mutations of SQSTM1 occur in about 40% of patients with a family history of PDB and up to 10% of “sporadic” cases. The mechanisms by which SQSTM1 mutations lead to PDB are incompletely understood, but seems that all mutations described interfere with the ability of p62 to bind to ubiquitin. This leads to enhanced NF-kB signaling and increased sensitivity of osteoclast precursors to RANKL and so a major ostoclastogenesis. The SQSTM1 is also involved in the apoptotic cascade and mutations of the gene that interrupt apoptosis pathway lead to an increased number of Pagetic cells. The reducing prevalence of PDB in some countries over recent years and delayed onset in offspring of patients who carry SQSTM1 mutations indicate that environmental triggers also play a significant role in regulating disease occurrence and severity. Viral infection is the first suggested environmental trigger of PDB rooted in the observation of inclusion bodies, viral nucleocapsids, in osteoclasts from affected patients. This led to the suggestion that PDB may be caused by slow paramyxovirus infection of osteoclast precursors. Experimental studies have shown that paramyxoviruses enhance osteoclast formation in vitro and that bone turnover is enhanced in mice overexpressing measles virus nucleocapsid protein in osteoclasts. However, these effects are not specific to paramyxoviruses because other viral proteins, such as HLTV1 Tax, have been found to enhance bone turnover in mice. Other possible environmental triggers, such as childhood dietary calcium intake, mechanical loading of the skeleton, zoonotic infections, and pesticides and toxins have also been suggested as triggers for PDB. Recently, have been identified single nucleotide polymorphisms that predispose to PDB at the CSF1, OPTN, TNFRSF11A, TM7SF4, NUP205, PML, and RIN3 loci were significant risk factors for the development of PDB. The CSF1, TNFRSF11A, and TM7SF4 loci contain strong functional candidate genes for PDB susceptibility. The CSF1 gene encodes macrophage colony stimulating factor (M-CSF), a cytokine that is essential for osteoclast and macrophage differentiation because it stimulates the RANK expression. The TM7SF4 gene and encodes dendritic cell–specific transmembrane protein(DC-STAMP),a cell surface protein that is essential for the formation of multinucleated osteoclasts and macrophage polykaryons. The TNFRSF11A gene encodes RANK, a receptor that is essential for osteoclast differentiation and bone resorption. Another polymorphism that seems to be involved in PDB is that of NUP205 gene, which encodes the nucleoporin 205 kDa protein, a component of the nuclear pore complex, that have a role in the shuttling of proteins between nucleus and cytosol. Another gene that lies within the 10p13 locus is OPTN, which encodes optineurin; a protein involved in regulating NF-kB signaling and autophagy. Mutations in OPTN have been described in glaucoma and motor neurone disease, but the role of OPTN in bone is unknown. The most likely candidate gene for PDB susceptibility within the 14q32 locus is RIN3,which encodes Ras and Rab interactor 3 protein. The RIN3 protein plays a role in vescicular trafficking by interacting with small GTPases and could conceivably affect osteoclast function through this mechanism, but its role in bone cell function has not been studied. Another gene studied is that for the PML protein in 15q24 locus. This protein is involved in regulating cell growth, apoptosis, and senescence and also has been shown to regulate TGF-β signaling, which is also involved in coupling between bone resorption and formation by inhibiting osteoclastic activity. These genes showed independent association with PDB and together they represent the genetic variants accounted for 86% of the population-attributable risk of PDB. Pagetic people usually don’t show alterations in urinary escretion of calcium, but hypercalciuria is present if in the osteoporotic phase there is a great bone resorption. This explains the increased incidence of urinary lithiasis in these patients. In males hyperuricemia and gout can often be seen. Loss of vision and deafness due to the compression respectively of the III and VIII cranial nerve by deformed bones. Medical treatments can help decrease the symptoms of Paget's disease, but there is no known way to reverse the effects on the bone. Patients with no symptoms require no treatment apart from observation and periodic X-rays may be recommended. For patients who have mild pain from the disease nonsteroidal anti-inflammatory drugs (NSAIDs) and aspirin can be very helpful. The history of available and effective therapies for Paget’s disease began in the early 1970s with the initial use of intravenous mithramycin. This cytotoxic cancer chemotherapy reduced the abnormal bone turnover of Paget’s disease but also produced toxic side effects such as nausea and vomiting and elevations of hepatocellular enzymes. The arrival of parenterally administered salmon calcitonin in the mid-1970s lowered the classical indices of pagetic bone turnover by about 50% in most cases and produces radiological improvement. While this was a signal advance, complete control of disease activity was not achieved and some patients developed antibodies to calcitonin, as a result, the calcitonins have been supplanted by the bisphosphonates. There are several types of bisphosphonates that are taken by mouth (oral form) or by injection (intravenous form) and their clinical potency is determined by a combination of their affinity for hydroxyapatite (which determines skeletal uptake) and the potency of their inhibition of the target enzyme. The first bisphosphonate to be used in Paget’s disease was etidronate, but it inhibites hydroxyapatite crystal formation causing osteomalacia. So other bisphosphonates, clodronate and tiludronate, were developed with a view to dissociating the anti-osteoclastic and mineralization-inhibiting properties of these drugs but a dramatic increase in antiresorptive potency resulted from the introduction of a nitrogen atom into the bisphosphonate side-chain, creating the amino-bisphosphonates. It became clear that pamidronate was much more effective than previous agents, but that it had a significant frequency of upper gastrointestinal intolerance. Potent oral bisphosphonates in particular alendronate and risedronate have a good safety profile but they can cause upper gastrointestinal issues. Today a single intravenous dose of zoledronate has produced the highest response rates and the most sustained remissions of any medication studied so far but often causes irritation and flu-like illness. Moreover intravenous bisphosphonates are potentially nephrotoxic and zoledronate should not be administered if the glomerular filtration rate (GFR) is < 30 ml/min. Potent bisphosphonates can produce symptomatic hypocalcemia in individuals with marked vitamin D deficiency. In patients at risk of vitamin D deficiency, supplementation before treatment is advisable, if necessary with a single large oral dose of the order of 100 000 units. Moreover several other bisphosphonates such as neridronate, olpadronate and ibandronate have shown substantial efficacy in Paget’s disease and a non bisphosphonate, gallium nitrate, has shown reductions of SAP with small doses of drug in limited clinical studies. Surgery is used mainly to treat the complications of Paget's disease. Surgery may be needed if there is a fracture, if the bone is badly aligned, or if severe arthritis develops. Surgery may also be needed if the enlarged bone begins to compress nerves, especially in the spine or skull. In the rare cases of Paget's sarcoma, surgery is almost always used to try to remove the tumor entirely. Chemotherapy and radiation therapy may also be used. With the exception of juvenile Paget’s disease, which is an autosomal recessive condition, all of these disorders are inherited in an autosomal dominant manner. Mutations of the TNFRSF11A gene, which encodes RANK are responsible for the syndromes of FEO, ESH, and EoPDB. These disorders share several features in common including the presence of focal osteolytic lesions, premature deafness, and premature tooth loss. The causal mutations are duplications of between 15–27 nucleotides in the first exon of TNFRSF11A, which introduce between 5 and 9 additional aminoacids residues into the RANK signal peptide and prevent it from being cleaved normally. This causes the abnormal RANK molecules to accumulate in the Golgi apparatus. Because of this entrapment of RANK there is an increased NF-kB activity. Although similar mutations of TNFRSF11A have been excluded as a cause of classical PDB, there is strong evidence to suggest that common variants at the TNFRSF11A locus predispose to the disease. Mutations in the TNFRSF11B gene encoding osteoprotegerin (OPG) are the cause of juvenile Paget’s disease (JPD). This is a rare disorder associated with grossly abnormal bone remodeling, bone expansion, and bone deformity which presents in childhood and adolescence. Various mutations have been described in JPD including deletions involving the whole gene and various missense mutations. These are loss-of-function mutations that result in the OPG protein not being produced at all or that result in formation of an abnormal OPG protein, which is incapable of binding to RANKL and inhibiting bone resorption. Mutations of TNFRSF11B have not so far been detected in classical PDB, but there is some evidence to suggest that variants at the TNFRSF11B locus predispose to PDB at least in women. Mutations in the VCP (valosin-containing protein) gene have been identified as the cause of IBMPFD, a syndrome characterized by myopathy, and dementia, which is often accompanied by PDB. The predominant clinical feature of this syndrome is myopathy, which typically presents after the age of 40 and is observed in 90% of patients. About 43% of patients also develop typical PDB lesions and 37% develop dementia. All of the mutations affect highly conserved amino acid residues clustered in the N-terminal domain of the VCP gene product, which is known to be involved in ubiquitin binding. 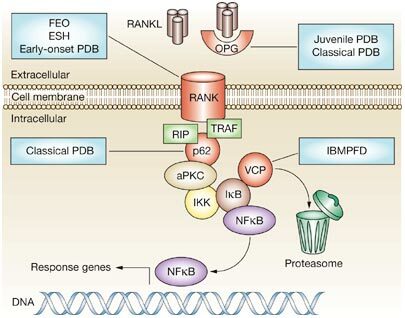 This finding is of interest in relation to the fact the VCP is known to regulate degradation of the IKB-α protein, which is involved in NF-kB signaling. Mutations of VCP have been excluded as a cause of classical PDB.